Social-climbing draper's assistant Arthur Kipps finds himself going up in the world when he inherits a small fortune. However, he attracts the attention of ruthless society gold-digger Helen Walshingham, who plans to trick Kipps into marrying her so she can get her hands on his money. Comedy, starring Michael Redgrave, Diana Wynyard and Phyllis Calvert. 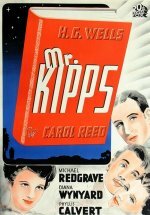 Critics were divided on the release of Carol Reed's adaptation of HG Wells's novel about the draper's clerk who discovers that, when it comes to social climbing, he has no head for heights. Some detected a certain detachment in Reed's direction, allowing Frank Launder and Sidney Gilliat's script to meander and supporting players to overact. But others claimed the film was stuffed with sly Wellsian satire, expertly staged set pieces and top-class acting from Michael Redgrave in the title role. The truth lies somewhere in between, for, while there is much to enjoy here, there are some interminable stretches, especially towards the end.